Wisconsin received more evidence this week that its taxes are too high…. The study, from the Pacific Research Institute in association with Forbes magazine, should give state and local policymakers new incentive to control spending so that taxes can be reduced…. There are reasons to be suspicious of some of the study’s assumptions about what contributes to prosperity…. State and local policymakers face tough decisions as they prepare the next round of government budgets. They should redouble their efforts to rein in spending so that tax cuts will become possible. It appears the editorial board is confused and conflicted. They are eager to cite a study they acknowledge as flawed because it provides red meat for their anti-tax appetites. They recognize that public investment in education and other things is the key to prosperity yet call for tax cuts. Maybe they should have just kept quiet. The problem with this kind of editorializing is that it creates a climate where the investments we need, like in education, get lost in the general anti-tax stance. 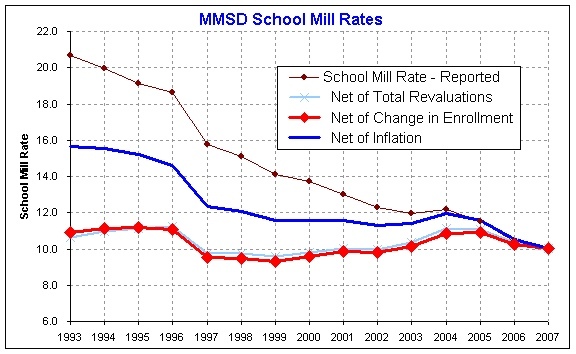 The graphic at the top is one measure of local investment in education and it shows that this is far from an area that needs “redouble[d] efforts to control spending.” Instead it indicates that due to the broken state school finance system, our investment has been lacking and that we can and should invest more by passing the November 4, 2008 referendum. There are good reasons to doubt both the conclusions and the source of the “study.” As the editorial notes, New York — with an economic growth rate of 4.4% last year — is ranked last, while South Dakota’s 2.3% growth rate is accompanied by a number one ranking in “Economic Freedom.” Obviously the relationship between “economic freedom” and prosperity is not as simple as the authors would like us to believe. I don’t want to go into the assumptions behind the construction of their index, but I do want to note that as usual with these right-wing think tank things, taxes are given much weight and no attention is paid to government fees. Wisconsin’s fees are relatively low and this skews thing mightly. The source, The Pacific Research Institute has been linked to Big Tobacco, the campaign against paper trails for electronic voting, anti-immigrant rhetoric in the battle against expanding government health care programs, attacks against LINUX and open source software, and work on behalf of the privatization of water rights. See a pattern here? I happen to know one of the authors of the current study, Eric Daniels. Eric and I were in Grad School together; a nice enough guy but nobody I’d look to for policy or moral guidance. Eric is an acolyte of Ayn Rand. Eric’s section of the report is the historical portion and it is a masterpiece of selective use of sources and data, sprinkled with authoritative pronouncements derived from Ayn Rand and Milton Friedman, all disguised as scholarship. Any honest man with a knowledge of history should see that those who want to help the less fortunate ought to embrace capitalism. He believes that both the Democratic and Republican parties of are guilty of pushing this dangerous socialist agenda. In a sense he is correct about this, in that both parties correctly see a positive role for government that goes beyond protecting persons and property and includes things like education, food and drug safety, infrastructure… In these days of Lehman Brothers and AIG, that he is wrong about the virtues of unfettered capitalism should go without saying. I think I know why the State Journal was so confused. They started with the mistaken assumption that the likes of Eric Daniels had anything useful to contribute. Support a better vision of the common good, Vote Yes for Schools!